Sara Richard's Blog: New Pieces Hot Off The Desk! New Pieces Hot Off The Desk! So! I've been a busy little bee trying to get a batch of new work to show at some of my upcoming conventions. May 23rd's my next one is in Manchester, NH for Granite Con! Come say Hi! So, I've been watching a sh*t-ton of Mystery Science Theater 3000 lately. My god, there are few times when true genius is shared with the common public and I believe MST3K is one of those cases. Have to say that I like the Mike era a bit better, so here is my tribute to the Robot Roll Call to the left. What else...hmmm....Oh! Went hang gliding for the first time this season last week....wind direction kinda sucked but I managed to make it back up to the 250' launch after having not flown for about 6 months. Oh. I also smashed my left pinkie on my speakers....that have blunt corners...and somehow put a gash in the top of my finger.....SARA SMASH!! Well back to work! I gots me a little commission with a Mr. Kit Fisto to start! Your Spidey is amazing :) Will you have prints available in Manchester later this month? That Mst3k piece is beyond awesome! I absolutely love the sketchy messy energetic style you put into it. 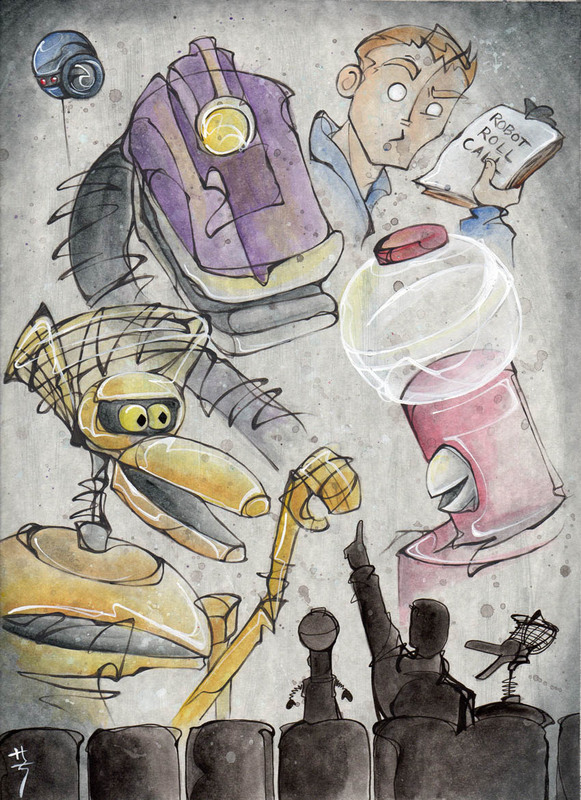 If you're going to Heroes Con in Charlotte, I'd love to get an Mst3k piece from you. We chatted briefly at C2E2, and I've been perusing your site. This is amazing stuff.